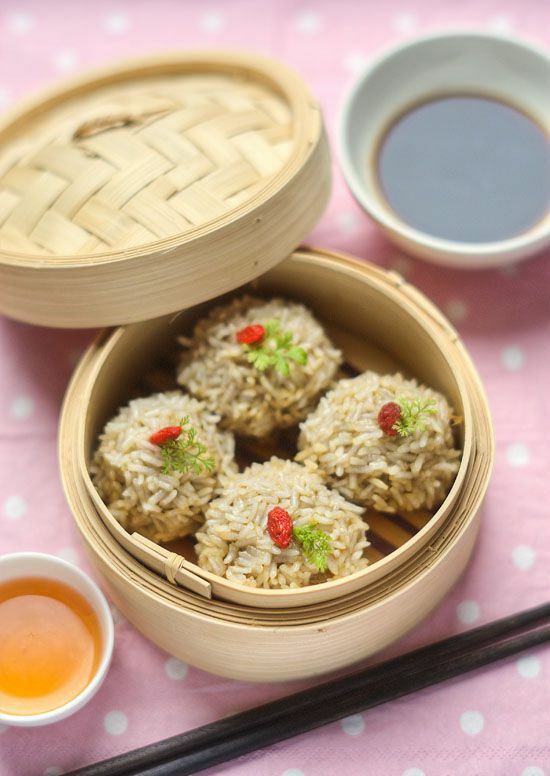 Pearl meatballs (珍珠丸子) are a classic Chinese banquet and party appetizer. While this is a meatball in the sense it’s a ball of meat because we cover it in a layer of glutinous rice (otherwise known as sticky rice) we give it a much more attractive name of “Pearl Meatball”. This is because the rice looks translucent and the color and shape of the meatballs looks like a pearl. Pearl meatballs originate from Hubei, China. Some people think this dish is a Cantonese dish and some people think this is a Hunanese dish however the correct origin of this dish will be Hubei. One of the most popular stories behind this dish is the founder of the state of Dahan (大漢), Chen Youliang, originates from Mianyang (沔陽, Xiantao 仙桃市 in present day), Hubei. His wife made these pearl meatballs before a battle for his army and hope to cheer them up so they will win the battle. Another saying is the wife of Chen Youliang made this dish for the soldiers who have digestive system problems so they won’t starve in battle. With this dish being made with mince and ground rice the soldiers can easily digest this with both meat and rice. This is a popular dish in both banquets and Chinese reunion dinners. In Chinese culture objects that are usually round shaped are associated with the meanings of reunion and being together. Also even though the name is quite attractive the most important thing about this dish is it’s absolutely delicious. When purchasing mince for this dish, do try if you can to purchase mince that contains a slightly higher percentage of fat as this will vastly improve the texture of the meatballs. Alternatively, if you don’t want to increase the fat you can add tofu into the meatball mixture instead. It’s not quite the same thing but will make the texture of the meatball a bit softer. You can use pork mince or beef mince. Traditionally Chinese people make this dish from pork mince but if you’re not so keen on pork you can substitute it with beef. Also, I personally use long grain glutinous rice (sticky rice) for this recipe. Traditionally Chinese people have used long grain sticky rice for savory dishes and short grain sticky rice for dessert. Use a food processor to mince the meat together and after the meat has totally blended add an egg to the mix and process for another 30 seconds. Soak the dried shitake mushrooms and dried shrimp in separate bowls with warm water until they are soft. Once soft chop both finely. Chop the ginger and carrot finely. Place all the meat into a mixing bowl and start to mix the meat in the same direction all the time, i.e., clockwise or anti-clockwise this is entirely up to you. Mix it for 3-4 minutes and start to beat the meat for couple minutes to help the meat get that wonderful slightly firm and springy texture. Mix all the ingredients together with all the seasoning and mix them evenly. Wet both hands with cold water and roll the mixture into small but equal size balls. Coat the meatballs with a layer of glutinous rice (sticky rice). Use a bamboo steamer or regular steamer to steam the meatballs for 12-15 minutes at full gas power. If you use a bamboo steamer to steam the meatballs, don’t forget to check the water in the pan or wok often in case the water dry out before the meatball is cooked.